Over the years, the Singapore Tourism Board (STB) has been making historic precincts more vibrant by working with stakeholders to organise festive events and introducing creative street décor. Through these efforts, the STB seeks to promote interest in the history, culture and architecture of these precincts. 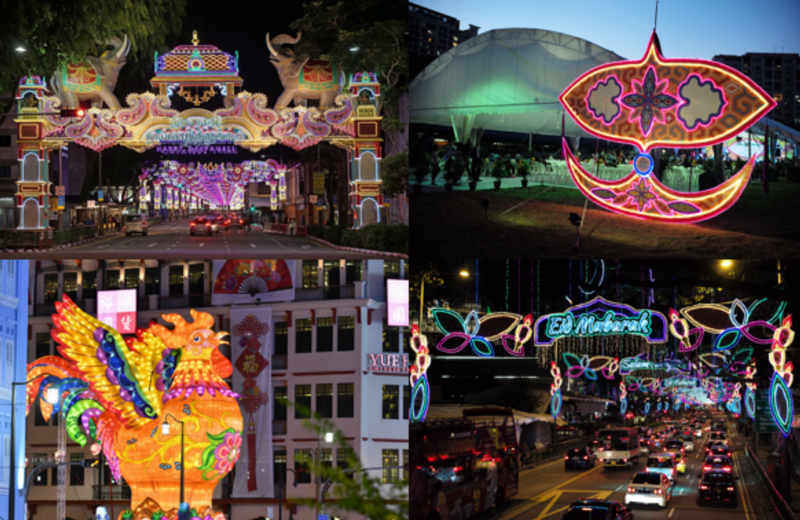 The annual street light-ups in historic precincts during major cultural festivals, such as Chinese New Year, Hari Raya and Deepavali, have become iconic events for locals and tourists to enjoy. The light-ups not only beautify the streets but also tell the stories behind the festivals. Similarly, the URA has introduced Our Favourite Place programme that supports community-initiated projects, such as Under the Gelam Trees @ Sultan Gate, where a giant swing introduced a fresh experience for visitors tReao the park at Kampong Glam. In addition to street light-ups, public art initiatives help enliven historic precincts. For example, ARTWALK Little India, which has been part of Singapore Art Week since 2015, uses wall murals, storytelling, workshops and performances to share the history and personal stories of the Little India community.